Seasonings Greetings! 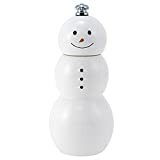 The hustle and bustle of the holiday season can get quite hectic, but that will all melt away when you see this cool new Snowman Pepper Mill from Fletcher's Mill of Maine sitting on your kitchen countertop or dining room table. Handcrafted from solid maple, this festive pepper mill is shaped like an adorable little smiling snowman patiently waiting for someone to twist his head around to grind and dispense some fresh cracked pepper. It features laser-engraved facial features and buttons, a two-step stainless steel grinding mechanism that first crushes peppercorns to release natural oils and then grinds them down to the desired consistency, and the grinding mechanism pops out for easy cleaning. 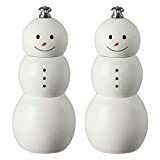 Best of all, this whimsical pepper mill snowman won't melt away on your table, so it's perfectly cool to use him all year round.